Back in 2011, I wrote a post for Wild Fidalgo about Baby Pictures. Blogger used to put a "Next Blog" link at the top of their pages for exploring other Blogger sites. Every time I tried it, I always found myself mired in other people's baby pictures. Not to be outdone, I wrote that post about Northern Flicker baby pictures. I guess that's what Facebook is for now, and Blogger has removed the link. I now have another opportunity to post my own "baby pictures" of sorts. 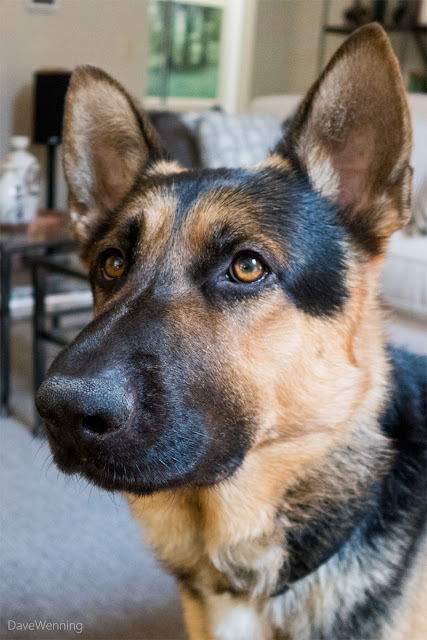 Buddy became my best friend last July through the services of the Washington German Shepherd Rescue group. I haven't had a dull moment since. He is estimated to be 2 years old, although some of us think he may be younger. He acts like a big kid. All we know of his history is that he was a stray. All I know is that he is the most charming stray dog anyone could imagine. Fidalgo Island Crossings may now be visited over a secure connection using the URL HTTPS://fidalgoweather.net. 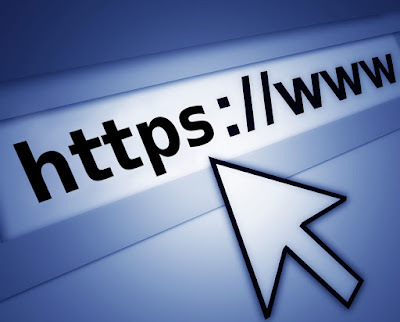 Links and bookmarks using the unencrypted HTTP format should also work and redirect to the HTTPS environment. If you are having difficulties, try switching the address to the HTTPS form. Also, apologies are in order. Visitors to the Weather page may have noticed the weather data is missing. The outfit that hosted this data was sold to a holding company. On a day's notice all of their accounts were migrated to another host, something called Site5. This immediately stopped the data feeds from the weather station. 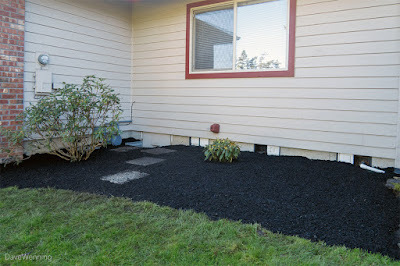 In the previous post, I described the gardens I found at the townhouse where I live now, and how they looked after the first day of landscaping work. On the second day of work, several new plants were added to the beds. As requested, the landscaper brought me five Rhododendron yakushimanum hybrids. They're called "Yaks" in gardening lingo. We planted one in the street-side bed. 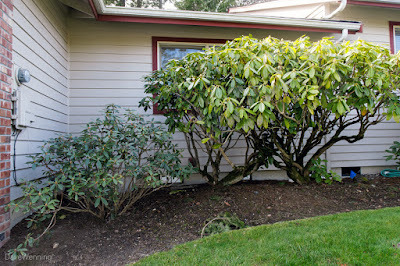 Among my favorite rhododendrons, they grow to 3-4 feet high and wide. The blossoms open a deep magenta, gradually turning pink, then white as they mature. That little guy is obviously lonely in that bed. I'll be doing some shopping to find him some companions that will add height, texture and color to this shady spot in front of the house. 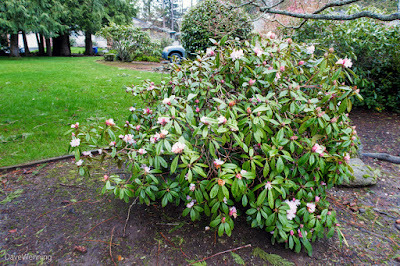 There are early/winter blooming rhododendron varieties such as 'Christmas Cheer' or 'PJM'They sometimes get mixed signals from weather or daylight which stimulate blooming The weather here this winter has been fairly typical although we have gotten more rain than usual. 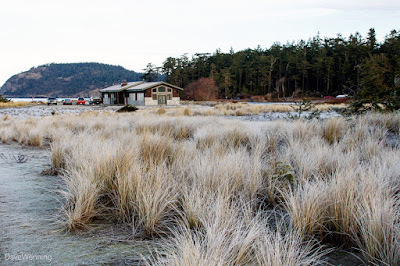 Early this month, we had a cold snap where the temperature dropped to 27° F, -3° C. Since then, the temps have remained above freezing and as high as 58° F, 14° C. Our typical overcast has been broken up by several days with bright sunshine.